Insular Life’s volunteer group recently celebrated its 6th year with the Gawad Kalinga Manggahan Village by initiating the repair and repainting of its Tambayani Center. On April 28, volunteers trooped to GK Manggahan to start the repair and repainting of the Tambayani Center with the SAGIP kids. Children were grouped and given tasks according to their age brackets. The youngest, 6 to 8 year olds, were tasked to remove the books from the shelves and pack them in boxes as the book cases are also set to be repainted. Children 9 to 10 years old, were asked to sweep and mop the floor and dust the surfaces, while children 11 years and above were tasked to help paint the walls. Later, as everyone was eating lunch, Jollibee made a surprise appearance, danced, and posed for photos with everyone present. Insular Foundation thanks everyone who has been a part of its volunteer group. 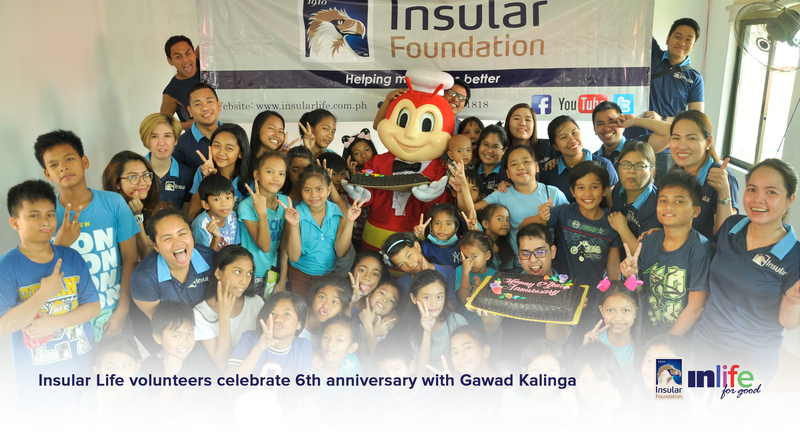 Happy 6th Anniversary, Insular Life volunteers!